4" OD Supertrapp muffler on Virago 250. The optimal number of 4 inch Supertrapp discs for a Virago 250 is probably somewhere between 8 and 14 discs. I still have not driven it enough, but basically it sounds smoother than my old system. It sounds smooth and powerful but I think I still like the sound of my first exhaust better. 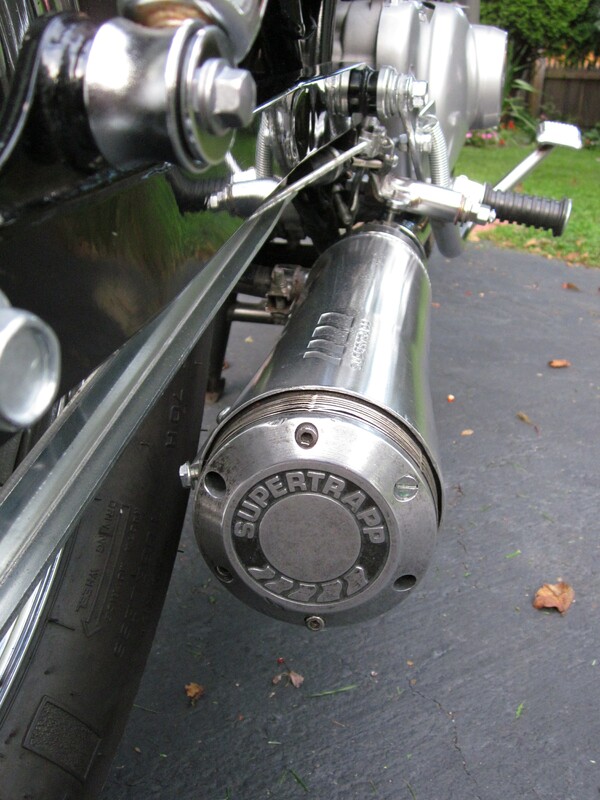 My first exhaust had more of a v-twin sound, the Supertrapp has a little more of a smooth sportbike sound. I think the Supertrapp sounds different to me, too, because the sound does not come out the back of the muffler – it comes out at a 90 degree angle – which should make it seem louder to the rider. So far it seems like the torque is improved a little. Mine came with 8 discs – once I get used to how it performs with the 8 discs, I will remove four of the discs which should result in more torque and less horsepower. To be continued ……. update 9/14/11 — With 4 discs and without the exhaust shield, the sound is softer and more powerful and it reminds me of a Moto Guzzi. So far, I cannot feel more torque with 4 discs. ——- So what’s the problem ? ————— The problem is, people that have done dyno tests got the best results with more discs (as much as 28 discs). ———————- So I might might go back to 8 discs, but I will use the 120 degree exhaust shield this time to reduce the noise that the rider hears. update 10/08/11 — I added lock washers that are about 1.3 mm thick. This adds open spacing equal to about 2 discs – so now I have the effect of 10 discs. If the exhaust shield is not installed: …… 1) Rider will hear muffler more – I found it was fine with 4 discs and too much with over 4 discs. …….. 2) It makes it harder to identify exhaust leaks – with no diffuser you can feel the exhaust from under the engine on the left side of the bike. …….. 3) More heat is given off to parts of the bike (such as saddlebags) that are close to the exhaust outlet. Per the 1 disc per 27cc rule (for 4 inch discs): For 4 inch discs – 1 disc per 26.7cc – so for 250cc you need 9 + 2 = 11 discs. (The first and last disc in a stack have almost no flow so you need to add two.) So 11 discs is “best” for 250cc engines in general. The optimal number of 4 inch Supertrapp discs for a Virago 250 is probably somewhere between 8 and 14 discs. 8 discs should give you more torque; 14 discs should give you more horsepower. -Les S.
This entry was posted in Motorcycles and tagged how to make virago 250 sound better, Supertrapp, supertrapp 250, Supertrapp Virago, V-s, V-Star 250 louder, V-Twin, Virago 250 exhaust mods, virago 250 loud muffler, Virago 250 modifications, Virago 250 mods, virago 250 sound, Virago 250 updates, XV250 exhaust mods. Bookmark the permalink. Hope this helps, and thanks for asking. Let me know how it goes. -Les S.